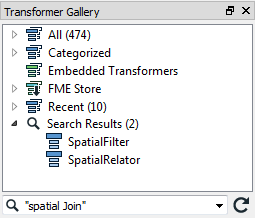 There are search functions in both the transformer gallery and Quick Add dialog. To perform a search in the transformer gallery, simply enter the search terms and either press the key or click the search icon (the binoculars icon). Search terms can either be full or partial words, and may consist of a number of keywords, including quote marks to enclose a single search reference. 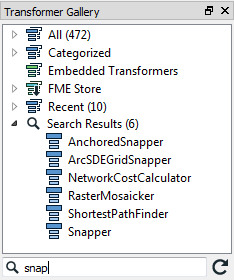 By default, Quick Add does not look in transformer descriptions, so the search term must be the actual name of a transformer. 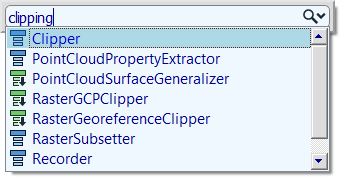 However, Quick Add will search in the transformer descriptions if you press the <TAB> key. 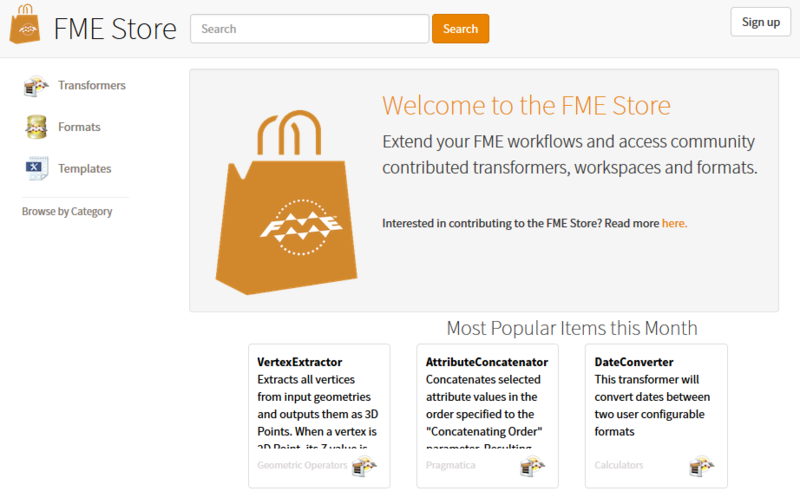 Quick Add results include aliases - for example transformers that have an alternative name or which have been renamed - and also include transformers found in the FME Hub. Transformers from the store are flagged in Quick Add with a small, downwards-pointing arrow, to denote that they will be downloaded if selected. Quick Add also allows the use of CamelCase initials as a shortcut. CamelCase is where a single keyword is made up of several conjoined words, each of which retains an upper case initial; for example AttributeFileWriter (AFW) or ShortestPathFinder (SPF). Try these questions to see if you can search for transformers.